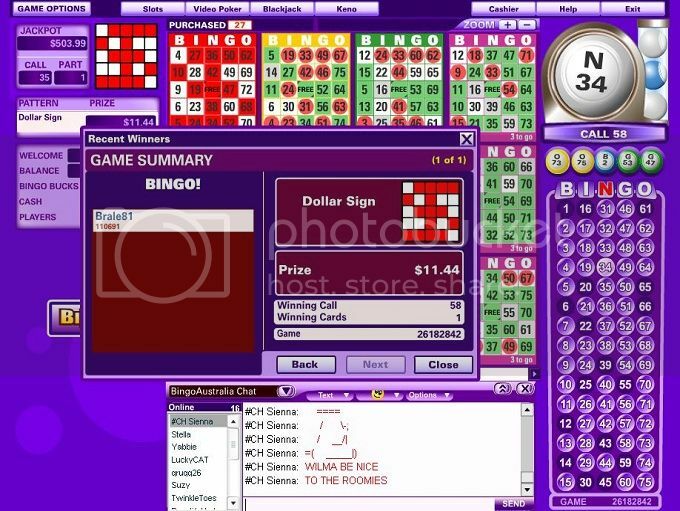 I remember I had so much success playing at Bingo Canada so I hoped that the same scenario would repeat with Bingo Australia. I have to admit, at the first glance the site is a bit confusing and at the beginning a rooky mistake has happened; I selected the cards but forgot to buy them. I'm sure that has happened to everyone. I was in a Purple room or 'May Contest room' and the first game I got to play was 'Dollar sign' and I won $11.44. I couldn't believe my eyes; I thought that something had to be wrong, so I decided to keep playing in the same room. There were not many players and for the first time I managed to have a few successful games. I decided to enter '10c PJP Patterns' room but unfortunately at that moment there was only few players; I bought tickets and the prize was only $6.54. I actually won again but since no one bought tickets for the next game I decided to leave the room. I entered again into Purple room and I made a rooky mistake. I actually bought tickets for $8 and total prize money for that game was $6.93. It was an embarrassing moment but I tried to tell myself that I wasn't the first one to be so reckless. I was so happy when I finished playing at Bingo Australia. I finally ended my bingo day without losing all my money; my balance was $26.52 and I'm sure I will go back and play more.